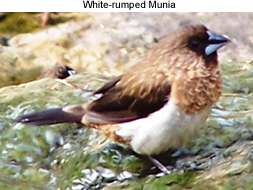 The Munias, Mannikins and Silverbills are small passerine birds in the genus Lonchura of the estrildid finch family. They are resident breeding birds in tropical areas -- with most variety being found in southern Asia from India and Sri Lanka east to the Indonesia and the Philippines. They are small gregarious birds which feed mainly on seeds. In captivity, a standard finch mix will suit them fine, in addition to soft food (hardboiled, mashed eggs - especially to be provided during the breeding season) and green foods. Sprouting seed is the simplest way to provide your birds with fresh greens and make a great weaning food. Most are found in relatively open habitats. The nest is a large domed grass structure into which 4-10 white eggs are laid. Some species also build communal roosting nests for overnight rest. A standard finch boxes can be provided (either half open or hole entrance). Like society or zebra finches they will all stuff themselves into one box. They do well in aviaries. If you can't set up an aviary -- these indoor flights work well. They are very social and peaceful finches.